The funny thing is that if you look at the picture, you wouldn’t have any clue that under the rice, there is a layer of beautiful wilted dandelions. Even through the transparent glass, you cannot see those colorful greens. I just love dandelions. In France, we get a different kind, they’re smaller, and the leaves are more dented and are more flavorful, probably because the ones you get here in the store are grown and not wild. When I was young with my parents we used to go pick them up from fields, that was the fun part, then the cleaning part, I hated it. They have tons of dirt and you have to remove the bad leaves from the outside, it can take the whole day and really I would have preferred to do something more “kids friendly”. They grow everywhere, but not all year round. You need to pick them up in March, then after, they grow big and their yellow flower blossoms. I loved those so much, I was going crazy for those pissenlits. My mom prepared them with lard fumé (our version of smoked bacon) and croutons. The ones you get here are too hard to eat as a salad, so you have to cook them like spinach. Either you saute them directly in the pan, or you boil them in water, then saute them in olive oil and garlic. Those dandelions tend to be slightly on the bitter side, not fitting everyone’s taste. I love it. I need to diversify my posts since there are almost no meat recipes, it’s just that I do not enjoy cooking meat. I run into some article about Brendan Brazier the famous tri-athlete who is vegan and explained how he gets tons of energy just from a raw food diet and that’s the best diet you can follow for performance. It’s just amazing to see how vegetables and grains can turn your body into a turbo engine. I am not a tri-athlete nor planning on becoming one for sure (I can barely swim), nor planning on living on just raw vegetables, but I really think we have to nourish our bodies with the best possible nutrients and I don’t think meat is included in that list. Going back to my fish, it’s a great combination of ingredients, flavors and textures. 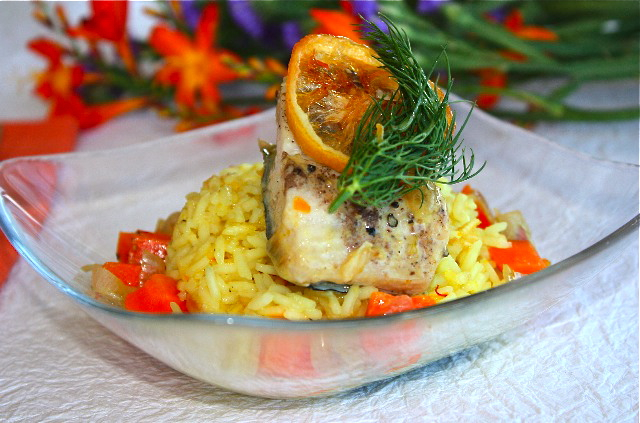 The cardamom added to the fish and the candied lemon turns this dish into an elegant entrée. The saffron rice is so delicately flavored and lays on top of the wilted dandelions, like a perfect color match. I used fish stock I brought back from France, they come in cubes and are an alternative to fish stock (Fumet de poisson, if you don’t have any). I will leave the fishes alone for a while…if I can…but I can’t promise it. For the saffron rice, you can use the traditional way of steaming rice in a pot or a rice cooker. It depends on the time I have and still use both. Mix saffron and broth together, and let saffron dissolve for about 20 minutes. Add broth to rice, bring to a boil, then reduce heat at the minimum, cover with a lid and cook for about 20 minutes. Remove from heat and let it sit for about 10 minutes before fluffing with a fork. Bring large salted pot of water to a boil, add dandelions and cook for about 10 minutes until the dandelions are cooked but do not overcook. Drain well, and squeeze extra water. Heat olive oil in a pan, add crushed garlic, stir for 1 minutes without burning the garlic, and add dandelions, salt and pepper, stir well, to mix all ingredients. You can keep the dandelions aside and sauté them at the end before serving so they don’t get cold. Heat olive oil in a pan, add shallots and carrots, when cook half through, add fish, cardamom, thyme and laurel, add wine. Cover and let cook until the fish is cooked and wine reduced. For the sauce, mix white wine and stock and reduce, then add cream and reduce a little more. For plating, divide dandelions at the bottom of a dish (I would use a hollow dish) then add rice, one mahi mahi filet on top, place carrots around. pour with sauce and one slice of candied lemon on top. This entry was posted by silvia on September 13, 2009 at 7:28 am, and is filed under Fish/Seafood. Follow any responses to this post through RSS 2.0.You can leave a response or trackback from your own site. Mmmm, I love dandelion greens. I bet the candied lemon and that slight bitterness of the greens match so well together. Gorgeous post. I love how fragrant and fresh everything is, like a heaping plate of endless summer! Brendan is such an inspiration. J’aime vraiment le mahi-mahi. Ta présentation est très belle. I received your Mahi-mahi recipe early in the morning New Zealand time! Now I’m soo hungry.The colours are amazing. Will be trying this with a bottle of Mahi Sauvignon Blanc tomorrow. Cheers.